A full description of installation HDM in instruments Roland E 86, Е 96 was added. 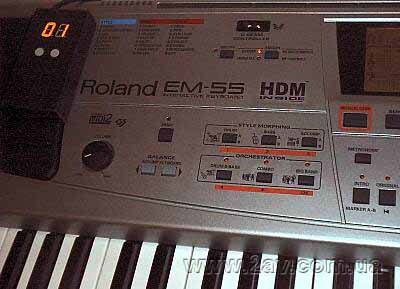 A full description of installation HDM in instruments Roland EM 50, EM 55, VA 3 was added. HDM successfully works with ROLAND VA-3. The installation is exactly the same as in ROLAND EM-55. HDM successfully works with ROLAND EM-55. In near future a full description of installation will be added. The program " HDM to HOST TERMINAL " now has the version 2.13. 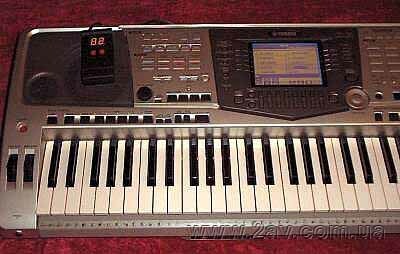 In this version such instrument as Roland E 86, Е 96, Korg iS 40, iS 50 are also supported. The descriptions of the installation HDM were updated. Attention! We've changed our e-mail. Send your information to the address valgit@svitonline.com Previous addresses are not valid!!! HDM successfully works with KORG i - 300 and ROLAND E - 86. A new (1.62) version of the device "Hard Drive Memory" (HDM) has appeared. The device became smaller, and doesn't demand an additional power supply (except for instruments YAMAHA PSR 340, 350, 540, 550, 730, 740 in which is used additional, now impulse stabilizer). So now you do not need to solder anything for installing HDM in musical instrument. Electrical hashes on the power amplifier YAMAHA PSR 730, 740 are practically completely removed. The installation in all types of instruments considerably has become simpler. You can look at the sound modules which are installed in MPAER - AV3 here. HDM successfully works with YAMAHA PSR 2000. The installation is exactly the same as in YAMAHA PSR 1000. New (2.11) version of the program "HDM to HOST TERMINAL" has been written. In the given version the problem of incorrect work of the program with slow computers is solved. 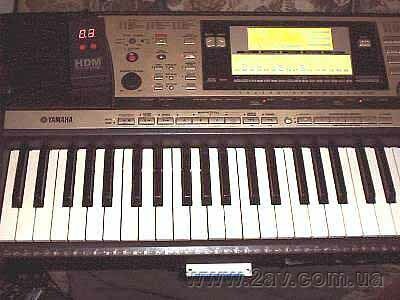 HDM успешно работает с YAMAHA PSR 740. 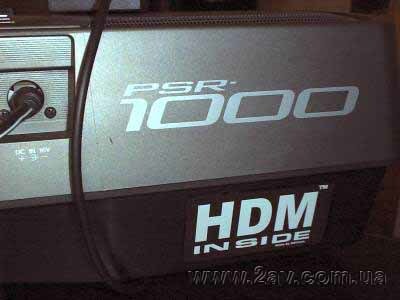 HDM successfully works with YAMAHA PSR 1000. Its installation in this instrument is very simple. You don't need to solder anything, there is no additional stabilizer. The instrument at once loads a song in itself and allows to look through the contents of banks during the reproduction of the song, as our MPAER - AV3HD. Well-known firm "Park Audio II" has begun batch production of a new model of power amplifiers of the popular series VX. These are - VX 700-8 and VX 700-4, which have output power 350 W on the channel on 8 Ohm and on 4 Ohm but have very moderate price. On - mine, new hits of sales have appeared. MPAER - AV3HD has a built-in hard disk for keeping information by a capacity 210mb. It is approximately 144 diskettes (banks). AV3HD's banks are protected from casual erasing. Now "Hard Drive Memory" (HDM) also has a capacity 144 banks (diskettes). Here bank is protected from casual erasing too. A new version of the program "HDM to HOST TERMINAL" is written. We took into account numerous wishes of users. The window of the catalogues became larger, the program became much stablese, the player is integrated directly into the program, sorting of files is added; you start your work from the last catalogue you've worked with. Now program recognizes the instrument, in which is installed "Hard Drive Memory" (HDM) by itself. Also you can directly from a computer install and remove protection of bank. The program already sees cyrillic and shows volume of chosen information. HDM successfully works with ROLAND G-800. Our 2AVCom has reached the age of three. We accept congratulations!!! The exhibition "Ukrainian musical fair" took place in Kyiv from October 18 till October 20, 2001. At the exhibition 2AVCom has presented new products: the midi - player MPAER - AV3 and its modification with a built-in hard disk; the device "Hard Drive Memory" (HDM) for keeping musical information on a base of computer hard disk (HD) and the program for connection of the given device with a personal computer; MIDICOM - the interface for PC, is intended for connection midi devices to a computer through the serial port; the interface MIDIJS is intended for connection midi-keyboard or other musical instrument to РС through a plug of a joystick on a sound map. The development of a new player of standard midi-files MPAER - AV3 and its modification with a built-in hard disk for keeping information MPAER - AV3HD is completed, the production of them is begun. It means, that you can always have at call more than 3000 midi-files, and have no problems with diskettes. A search of songs can be done during playing a song by native buttons. Many other technical parameters are improved too. HDM successfully works with ROLAND E-500. HDM successfully works with ROLAND EM-50. In near future a full description of installation will be added. 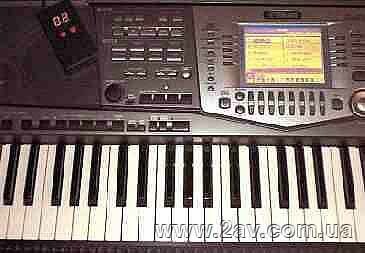 Also the serviceability of the device with new models YAMAHA PSR-350, 550 was checked. A full description of installation HDM in instruments ENSONIQ TS-10, 12, 10+ was added. 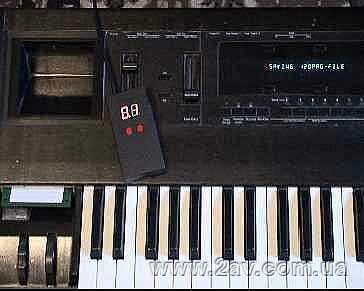 A full description of installation HDM in instrument YAMAHA PSR 350 was added. Instead of amplifiers PA 2454 F and PA 2604 F the firm Park Audio II began to produce models VX 900 and VX 1200. These amplifiers have much more improved performances at the price of the previous models. Details in section Rag fair in PDF files. 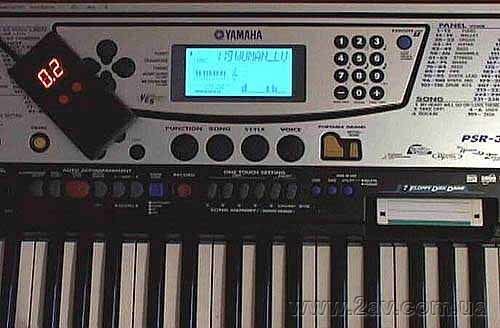 A full description of the installation HDM in instrument YAMAHA PSR 540 was added. How to install a hard disk for keeping information in yours PSR 630, 730, 640, 740 it is possible to look and to read here. 2.2, version of the interface of connection of the device HDM with a computer you can download HERE (200 kB, ZIP). We'll try to take into account all wishes concerning functionality and appearance of the offered interface. Also in near future some problems that originate at the users of the given program with the operational systems Windows 3.1 and Windows will be eliminated 95. Our HDM successfully works with synthesizers KORG i5S and ROLAND XP 50, XP 60, XP 80, and, of course, with Yamaha PSR - 630, 730, 340, 540, 640, 740, QS - 300; Korg - i 3; Mpaer. An interface of connection of the device HDM with a computer is written. It looks on a screen of the monitor approximately so. We'll try to take into account all wishes concerning functionality and appearance of the offered interface. This program you can download from our site. Now musical information can be copied directly from a musical instrument on a computer and from the computer on the musical instrument. Also it is possible to delete, to change titles and so on. We are two years old! We accept congratulations!!! We've got new dealers in Crimea, Lugansk, Kharkiv, Khmelnytsky, Ternopil, Lviv and other cities. Look in the section " Where to purchase ". According to the numerous requests of working musicians in the section of the answers and questions we put photos of the devices HDM built-in in instruments YAMAHA PSR - 630 and YAMAHA QS - 300. We apologize for a temporarily unfinished site. At the moment device HDM already has successfully worked more than month with such instruments: Yamaha PSR - 630, 730, 340, 540, 640, 740, QS - 300; Korg - i 3; Mpaer.